I have many queries on OSPF- Open Shortest Path First dynamic routing protocol from many of you. I knew for R&S guys, OSPF is one of the most important topic to study and to understand. Some of you asked me about the interview questions of OSPF, may be OSPF is one of the topic where interviewer always asked you about. I will probably discuss OSPF and its scenario step by step as there are lot of things in OSPF to understand but in this article I am going to explain the basics of the OSPF which you all guys should remember at the time of the interviews. Now let's talk about the most fundamental terms uses in OSPF. These terms are must remember terms for all the Network Engineers who are going to study the Routing and Switching domain. It uses dijkistra algorithm to propagate the traffic from source to destination. Dijkistra algorithm is also called as the Shortest path first algorithm. OSPF is detailed defined in the RFC 2328. As per the Cisco devices, OSPF AD value is 110; in HP and Huawei OSPF preference value is 10 and in Juniper internal OSPF value is 10 while external OSPF value is 150. OSPF protocol number is IP/89; It means it works on Layer 3. OSPF uses cost as metric for the shortest path calculation from source to destination. OSPF supports Plain and MD5 authentication. In OSPF the metric cost calculation is 100 Mbps divided by the link speed. OSPF uses multicast address for hello packets; 224.0.0.5 for all SFP addresses and 224.0.0.6 for all DR addresses. In OSPF you can modify the cost by the command "ospf auto-cost reference-bandwidth"
OSPF has 8 adjacency states and they are Down, Attempt, Init, 2-way, Exstart, Exchange, Loading and Full. In OSPFv2 we are using LSA to propagate the traffic towards the boundaries and LSA's are the one who define the range of the routes. LSA stands for Link State advertisements between the source and destination. In OSPFv2, there are different LSA uses and they are LSA1, LSA2, LSA3, LSA4, LSA5 and LSA7. In OSPF, there are generally 4 types of router which is known as Internal Router, Backbone Router, ABR and ASBR. ABR states for Area Border Router which connects two Areas in OSPF domain. ASBR states for Autonomous Boundary Router which connects two Autonomous systems. There are two kinds of externals routes that will come via ASBR router and they are E1 and E2 routes. E1 Routes are the routes whose value will be the Cost to the advertising ASBR plus the external cost of the route. E2 Routes are the routes whose value will be the cost of the route as seen by ASBR. Route Preference in the OSPF is like Intra-Area(O) > Inter-Area(OIA) > ExternalType-1(E1) > ExternalType-2(E2). 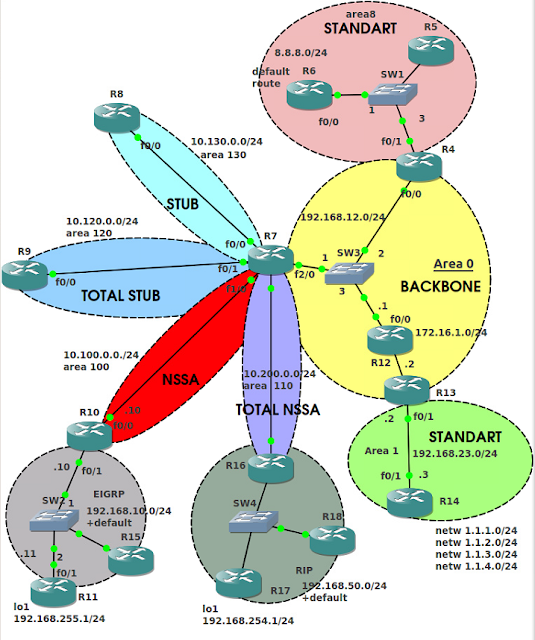 OSPF have different types of Area's and they are Backbone Area, Standard Area, Stub Area, NSSA Area, Totally Stubby Area. OSPF can be used in 5 different Network types and these Network types are Point to Point, Broadcast, Multipoint Broadcast, Multipoint Non-Broadcast and NBMA. DR/BDR selection procedure is done in NBMA and Broadcast Network types. Dead timer for Point to Point and Broadcast network type is 40 Seconds. DR/BDR selection is based on the Priority of the router followed by the Highest IP address on the interface. A virtual link can only be configured between ABRs. The transit area must have full routing information and it cannot be stub.